Japan is a country in search of some cheerful news right now. Earlier this week, the western part of the island nation was slammed by Typhoon Jebi, which left 11 dead and parts of the country flooded. That was followed, days later, by a magnitude-6.7 earthquake that rattled the country. In the baseball-crazed nation, there was still more distressing news when it was announced that superstar Shohei Ohtani, who plays for the Los Angeles Angels, will need major elbow surgery. So the Japanese are turning their attention nearly 7,000 miles away, to the US Open and the USTA Billie Jean King National Tennis Center courts, to find some uplifting news. For the first time ever, two Japanese players – Naomi Osaka and Kei Nishikori – have made it to the Grand Slam semifinals. “It’s good news to encourage the Japanese people right now,” said journalist Hidehiro Akiyama, one of more than a dozen writers and broadcasters from Japan covering the tournament. “There is no stopping the Japanese players,” was the headline in the Nikkan Gendai tabloid. SEE ALSO: Osaka and Nishikori make history for Japan. Osaka, 20, who will play last year’s Open runner-up, American Madison Keys, in one of the two women’s semifinals scheduled for Thursday night in Arthur Ashe Stadium, is the first Japanese woman semifinalist since Kimiko Date in 1996, in Wimbledon. August 30, 2018 - Naomi Osaka in action against Julia Glushko at the 2018 US Open. September 5, 2018 - Naomi Osaka in action against Lesia Tsurenko at the 2018 US Open. September 3, 2018 - Naomi Osaka in action against Aryna Sabalenka at the 2018 US Open. September 01, 2018 - Naomi Osaka in action against Aliaksandra Sasnovich at the 2018 US Open. Nishikori, 28, is back in the semifinals for the first time since 2016 and for the third time in his career, after losing in the 2014 Open final. In that match, Nishikori lost to Marin Cilic. On Wednesday, he defeated Cilic in five grueling sets. “Nishikori Gets His Revenge” blared the Sports Nippon headline. SEE ALSO: Kei Nishikori has come a long way to get his career back on track. Nishikori will play two-time US Open champion and reigning Wimbledon title holder, Novak Djokovic on Friday. “Awesome! Nishikori-san and Naomi Osaka get into the semifinals. Next match vs Djokovic. Please win!” wrote one Twitter account. Despite the 13-hour time difference, both matches will be broadcast live on Wowow pay television. Osaka’s unexpected run to the semifinals has also been good news to investors. Share prices of Osaka’s racquet producer, Yonex, have soared more than 10 percent on the Tokyo Stock Exchange. 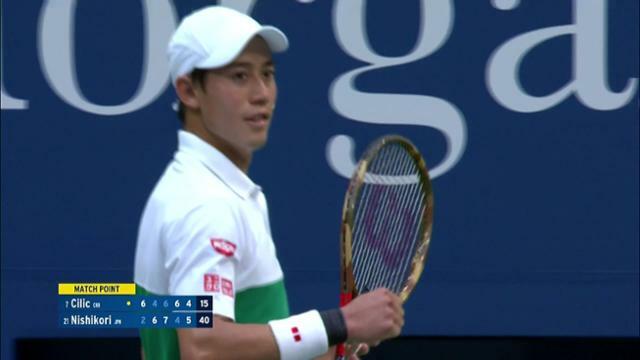 September 5, 2018 - Kei Nishikori reacts to winning against Marin Cilic during the 2018 US Open. September 5, 2018 - Marin Cilic in action against Kei Nishikori at the 2018 US Open. September 5, 2018 - Kei Nishikori in action against Marin Cilic at the 2018 US Open. September 5, 2018 - Marin Cilic in action against Kei Nishikori during the 2018 US Open. September 5, 2018 - Kei Nishikori in action against Marin Cilic during the 2018 US Open. September 5, 2018 - Kei Nishikori and Marin Cilic meet at net during the 2018 US Open.